Business Makeover Case Study – Support Services. This was the top attended session with 205 attendees (wow!). Business Makeover Case Studies consist of a member company who bravely agrees to “open the kimono” and talk about the biggest problems they face in their service operation, then receive input from a panel of experts on how to solve the problems. The audience also gets a chance to chime in. While finding someone brave enough to spill the beans about their own issues is difficult at each conference, clearly these sessions are hugely popular with members, the majority of which have the same or similar problems, or have solved them in the past. The brave volunteer for this session was Don Stanley – VP, Customer Support, CA Technologies. This session was moderated by Judi Platz. Next-Generation B2B Online Community. This was the 2nd top attended session with 156 attendees. Customer communities is always a hot topic, and Joe Cothrel from Lithium is always a big draw. (Checkout Joe’s new book, Social Customer Experience.) Here is the session description: If you think online communities are just discussion forums, think again. Companies like AppDynamics are stretching the boundaries of a B2B community, encompassing documentation, learning, ideation, app exchange and other elements to create a one-stop shop for sharing and learning. In this session, Steve Levine, Senior Product Manager at AppDynamics, will share the business rationale for creating such a hub and what it took to bring all the right pieces together. Joe Cothrel, Chief Community Officer at Lithium, will set the stage with some observations about B2B trends across Lithium’s global customer base. NetApp; and David Yoffie, Customer Impact Consultant, PwC; had 151 attendees. Here’s the session description: Technical Support organizations tend to be characterized by teams with product focus, serial escalation of more difficult problems, and complex workflows. NetApp has embarked on a path to bring the appropriate level of technical assistance as close to the customer as possible while continuing to improve support efficiencies. In this session, we will share an approach to achieving these goals while servicing a highly demanding, global, extremely heterogeneous customer population. Leaders and practitioners that would like to explore new ways of providing high levels of service in complex technical environments will be interested in this presentation. Power to the People! This session was led by Julian Lopez, Head of Customer Loyalty, Rackspace Hosting, Inc.; and Clayton Sherwood, Business Development Director, Clarabridge; received 131 attendees. Here’s the session description: During an epic 15 year journey, Rackspace® has transformed from an obscure San Antonio start-up into the global leader in hybrid cloud, the founder of OpenStack®, and a constant on Fortune’s list of 100 Best Companies to Work For. The home of fanatical support, Rackspace® now operates on four continents and is helping the world through the cloud revolution. Learn how they empowered customers to guide them on this journey by combining trusted disciplines and a fiery culture, with a unique set of tools. Then get a sneak peek into the future as they share their plans for empowering front line employees to drive the next wave of innovation. Business Makeover Case Study – Services Revenue Generation. This session, with another brave member discussing their top challenges, received 112 attendees. Longtime TSIA member Phil Nanus, Sr. Director, Business Development, SaaS, Infor Global Solutions, Inc. volunteered to discuss his challenges. This session was moderated by Julia Stegman, VP of Research for Service Revenue Generation. I Know Social Media. What the Heck is Social Support? Another social topic rounds out the top attended list with 101 attendees. I know from my annual social media survey that 46% of TSIA members are now interacting with customers via social channels such as Twitter and Facebook, but the majority of companies started doing this because marketing was monitoring social channels and started forwarding them Tweets from unhappy customers. How to formalize the program and do it right remains a challenge. This session was presented by Tim Albright, Senior Director Community Strategy, Jive Software, Inc.; and Matthew Stauble, Vice President, Global Customer Support, Palo Alto Networks. I will be back later this week with some final thoughts on today, the last day of TSW. Hope to see everyone at the Service Revolutions competition kicking off at 11am. Thanks for reading! 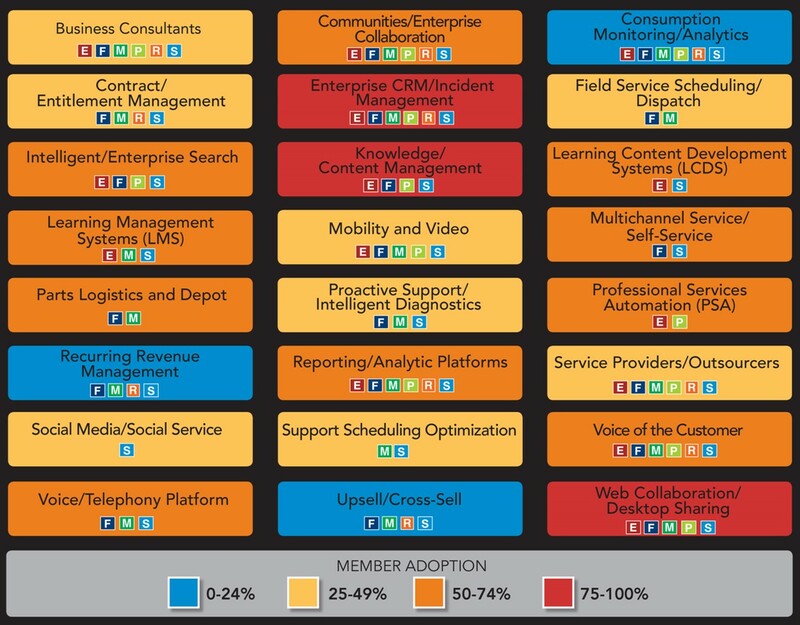 2014 TechFUTURES: What will Service operations look like in 2019? Analytics. “Big data” is not only a buzz phrase, it provides a solution to the explosion of enterprise data: harnessing the power of analytics to glean critical information from multiple, real-time streams of content. As an example, professional services organizations have historically run their operations using spreadsheets, only to find out at the end of the project that major milestones were missed, the project ran over budget, and customers are not satisfied with the outcome and are pushing back on payment. Today, we are beginning to see real-time dashboards that can pinpoint projects in trouble immediately, giving supervisors the opportunity to resolve problems and put the project back on course. With increased sophistication coming to analytics every year, what will big data look like in 2019? How will proactive dashboards evolve over the next five years? Collaboration. There are many drivers behind the growing budgets for enterprise collaboration tools by technology suppliers. Younger demographics entering the workforce prefer to share ideas and collaborate on problems. Mobile devices provide mechanisms to ask questions of peers from any location, on any device. The rise of expertise management is making it easier to identify the expert on any subject—or any line of code. The growing number of remote workers means collaboration can’t happen over cubicle walls—enterprise collaboration tools are required. Looking ahead to 2019, with collaboration becoming the default communication mechanism for employees, how will this change the way we work? Looking beyond just employees, what is the role of partners and customers in collaboration? Service Channels. The way we interact with customers has seen dramatic changes over the last decade. The shift from call centers to contact centers was forced by customers rapidly adopting emerging channels. First was email, offering a way for customers to thoughtfully describe problems without a phone call. Next was self-service, then chat, and today, rising adoption of social media channels means technology firms are interacting with customers via Twitter, Facebook, Google+, and more. Looking ahead to 2019, what will be the dominate interaction channels for customers? With the Internet of Things allowing every device in your home and office to be online and interconnected, how can we further streamline and automate technology support to leverage the new always-connected customer? TSIA has identified three technology partners to paint a vision of the future state of services, focusing on the topics defined above. The presentations will take us forward to 2019, and focus on “a day in the life” of Bob, a highly social, collaborative, connected, and data-savvy customer, as well as June, a high-tech support executive, responsible for consolidated service operations. How will the combined forces of analytics, collaboration, and evolving service channels impact June’s people, processes, and technology, and what new challenges can we expect from our future customer, Bob? Changepoint: Analytics 3.0 (Data + Analytics) = Business Opportunities. Analytics 3.0 is the heart of the next phase of global transformation—it’s where big data and analytics join forces with strategic operational and decision processes to create new accelerated opportunities and revenue streams for businesses, giving rise to the Data-Driven Economy. In this TechFUTURES presentation, Changepoint futurist Larry Kading takes you on a journey about how all organizations—not just the large online pioneers—can compete in the Data-Driven Economy. However, while new business opportunities and revenue streams abound as a result of this global transformation, they only exist for organizations that understand how to get there. Larry will share the secrets of how June can exploit the opportunity with game-changing, analytics-based products and services. Control the data or it may control you. Jive Software: Collaboration. The human brain is as powerful as 300 supercomputers, but excels at a certain kind of intelligence: creativity, innovation, and intuition. It is limited by its isolation and access to information, and because of its limitations, we have all adapted our behavior to machines much better at crunching numbers. Today, we are starting to carry devices more powerful than the original supercomputers with us all of the time that are always connected: the laptop, the tablet, the smartphone, smart watches, Fitbits, and wearable HUDs. In the next five years, the time may come when all of us will complement our own intelligence with hundreds of tiny, connected supercomputers that are able to instantaneously perform staggering analytics, expanding our concept of collaboration by presenting us with the right information, conversation, or access to expertise in the moment that we need it. In this TechFUTURES presentation, Chris Morace, Jive’s chief strategy officer and New York Times best-selling author, explores how much better it will be to work together in 2019. Find out what work will be like when we are empowered by powerful technology, and not tethered to it. Support.com: Service Channels. Support.com, Inc. is a leading provider of cloud-based services and software that enable technology support for a connected world. In this TechFUTURES presentation, Amy Millard will discuss how the Internet of Things will continue to create new opportunities and challenges. We live in a world where our devices monitor, track, and connect the physical world, and this will only increase in the years to come. As device interconnectivity begins to touch every phase of our lives in both the business and consumer worlds, the stakes rise higher and higher for a seamless customer experience. Amy will share how tech support teams can rise to meet these challenges. Please join us for this fun event to get your TSIA experience off to a great start. And as always, thanks for reading! Each year TSIA conducts the Global Technology Survey, tracking adoption, satisfaction, and planned spending across 24 categories of technology and services. The satisfaction section of the survey has delivered interesting results, with the majority of categories averaging a satisfaction score well below industry averages. There are, however, some clear outliers from these averages, with some technology or service providers well regarded by TSIA members and highly rated for member satisfaction. Bomgar. Bomgar is a leader in enterprise remote support solutions for easily and securely supporting computing systems and mobile devices. The company’s products help organizations improve tech support efficiency and performance by enabling them to securely support nearly any device or system, anywhere in the world—including Windows, Mac, Linux, iOS, Android, BlackBerry, and more. More than 8,000 organizations across 65 countries have deployed Bomgar to rapidly improve customer satisfaction while dramatically reducing costs. Bomgar has offices in Jackson, Atlanta, Washington DC, Paris, London, and Singapore. For more information, see www.bomgar.com. Coveo. Coveo helps companies provide more effective customer service by harnessing knowledge and experts from their enterprise knowledge ecosystems. Leveraging powerful unified search and relevance technology, Coveo surfaces relevant enterprise knowledge directly to agents and community members. With Coveo for Salesforce, Service Cloud Edition, related cases, articles, emails, experts, and more are searchable and surfaced in a single view on the Service Cloud console so agents can solve cases efficiently. Coveo for Salesforce, Communities Edition helps improve call deflection and customer satisfaction by automatically displaying content and experts related to topics members are discussing. Coveo is a salesforce.com strategic partner, with customers including Rally Software, Logitech, Deltek, EXFO, Tokyo Electron America, and SunGard. Learn more at www.coveo.com. DB Kay & Associates. DB Kay & Associates, Inc. helps support organizations create customer success and better customer experiences through sustainable knowledge programs. The firm consults and trains to drive best practic-es (such as KCS) and secure executive support, reducing risk and accelerating success. DB Kay leads customer experience mapping exercises to identify and fix customer experience issues. They offer everything from short strategy sessions to hands-on program management. Whatever the engagement, they know they’ve been successful when they’ve transferred knowledge effectively enough that their customers no longer need them! DB Kay customers include Ultimate, Sage, IBM, Carestream, Riverbed, Microsoft, and NetApp. For more information, go to www.dbkay.com. Today at Technology Services World, I will interviewing the three finalists in the TechBEST Best in Satisfaction Showcase at 12:45pm, immediately following TechFUTURES. Please join us to hear more about these companies, and what they do to ensure satisfaction customers. Thanks for reading, and hope to see you there! You are currently browsing the Ragsdale’s Eye on Service weblog archives for May 2014.